Dogs do it. Millipedes do it. Birds don’t do it, but humans definitely do it — some more than others. Of course, I’m talking about farting, one of the most natural biological processes, which is frowned upon in most cultures. Does it Fart? is the best book you never knew you wanted to read — it’s the ultimate guide to animal flatulence, a compendium of gassy stories. But don’t let the whimsical approach fool you; there’s a lot of solid biological info you just don’t find in most books. For instance, did you know that almost all mammals fart, but the sloth doesn’t? Dani Rabaiotti, a Ph.D. zoology student at the Zoological Society of London and co-author of the book, studies how climate change impacts African wild dogs. She teamed up with Virginia Tech ecologist Nick Caruso after facing an avalanche of Twitter questions regarding the ability of different animals to fart. “We just had a mutual interest in farts,” Caruso recalls. Farts come in different (how shall we put this) forms and intensities, and not all animals fart the same way. 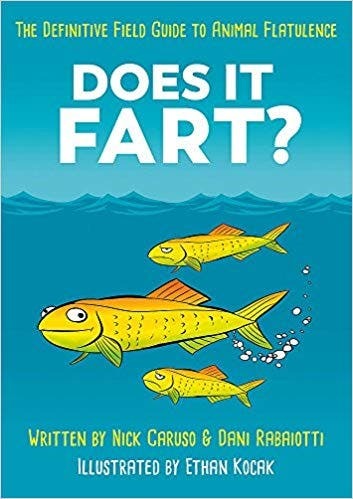 In fact, the two authors first had to decide on what a fart really is. They settled on a simple definition: gas that comes out of the end opposite to the mouth. But even so, things aren’t as simple as they might seem. For instance, what do you do with creatures that don’t have an opposite end? What do you do with creatures whose farts aren’t associated with digestion, but with other processes? Well, then you just explore the story and see what comes out of it. Herein lies the beauty of this book: sure, the subject is whimsical, but this kind of childish curiosity is too often missing in today’s scientific world. There are many things we don’t know about animal farts, and if you start to dig around, there’s a good chance you’ll find some very puzzling biological questions. Biophysical processes, including some which seem quite funny — like farting — are important for many creatures of the world, and there’s still so much we don’t know. Does it Fart? takes a boyish approach to it all, but it makes a very compelling case in doing so — the straightforward curiosity takes us off the beaten path, and it offers a refreshing reading experience. I read the book in two goes. I only stopped because I really had work to do — otherwise, I would have probably devoured it in one go. It reads a bit like Pokemon cards, or simple, animal-by-animal information tidbits. The book is masterfully complemented by simple drawings and also touches on human farting which, as I suspect you already know, is frowned upon in most parts of the world.